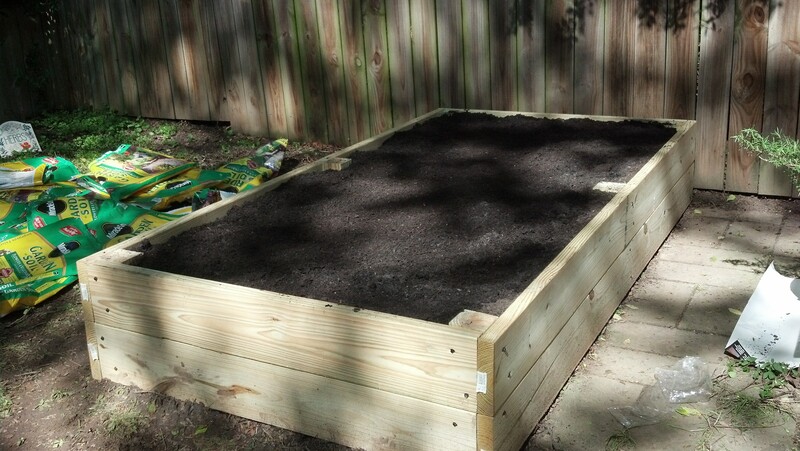 We had really great weather this past weekend so we decided to take advantage of being in Atlanta (the next few weekends we will be gone) and work on a raised garden bed to grow vegetables and herbs in our backyard, one of the things on my goal list!. I originally got the idea from someone at work. About a month ago, we bought all of the supplies but never got around to building it. Well it all came together this past weekend! 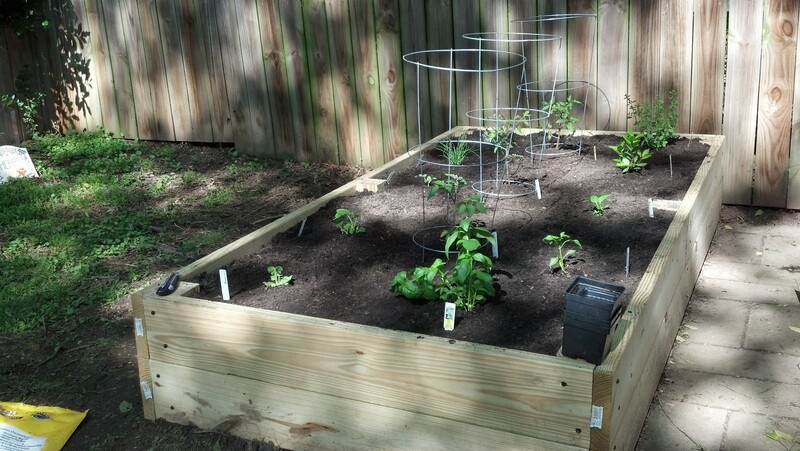 We followed another blogger’s design to construct our garden box. (We used pressure treated pine instead of redwood for cost reasons and skipped the irrigation system piece). The blog goes into the details of constructing and we basically followed their directions. I recommend checking it out if you want to build one. It took us about an 1-2 hours to put it together. 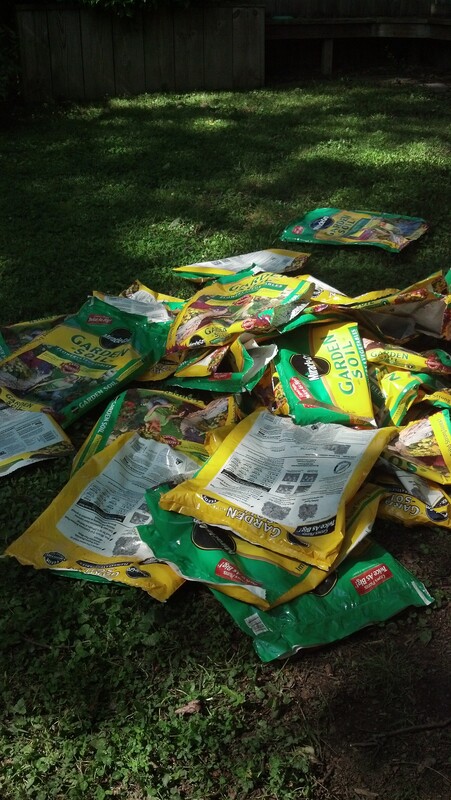 We got a deal on garden soil and purchased 40 bags to fill the raised bed. After building the box, we stopped by farmer D’s and picked up a few small organic plants to include in our garden box. So, our garden includes: 3 types of tomatoes, peppers, zucchini, squash, basil, bay leaf, oregano, chives, and lavender. Eric also decided to try growing watermelon (a small round one) so we planted along the side so that it will grow and flow into the yard. We also bought a small aloe plant that is in a pot on the side. The project took some time and a lot of work and sweat was put into its assembly but the end product was worth it. Now I’m crossing my fingers that at least 1 of these things stays alive for the season! Choose an interior room-most cruise ship rooms are tiny and this is especially the case for interior rooms. So why choose it? Well, it’s the cheapest room. In my opinion, when you are cruising, the last place you want to be is sitting in your room. So, take the saved money and use it elsewhere. AND if you tend to get seasick, lower level interior rooms are the most stable and have the least amount of rocking! Avoid purchasing drinks on the boat– Carnival allows you to bring 2 bottles of wine per person (above 21). This was just enough wine for our trip. Water, teas, and coffee are free. We aren’t huge soda drinkers so we didn’t buy the soda pass. But if you like soda, there were several people who just bought a 12pack or something of soda cans and carried it on the boat. Our room didn’t have a refrigerator but there’s always ice available. We also saw people carry on packs of bottled water. I try to avoid plastic bottles so I packed our own water bottles and just refilled them at the water stations in the dining areas. Avoid booking most excursions through the cruise– The excursion packages tend to be overpriced. If you are willing to wait and get off the boat, there are several other vendors that offer the same activities for less money. There is also the independent option. For example, Eric and I visited a beach in Freeport. It was a $14 taxi ride, free beach entry, and $5 for a beach chair. The same excursion the cruise offered wanted to charge ~$69/person for the same beach trip (included bus ride, chair, and lunch). Sure we didn’t have the burgers they had for lunch but we just went back to the boat to eat (since we already paid for that food). Minimize shopping on the boat– You are on a boat with nowhere else to go so you seem tempted to buy everything on board. It is cheaper to buy anything you need once you get off the boat at port. This is why it’s important to plan and pack everything you will need to avoid this expense. So there are ways to save some money on vacation. I don’t think these are the only ways, but they are simple and easy tips to keep in mind if you are looking for a budget cruise vacation. Finally, it also helped that Carnival has had a few issues with their boats lately which have been highlighted in the news. I decided to leverage this and took advantage of the especially low rates they offered (in my opinion, an effort to combat the bad press). Side note- please do not take money out from the gratuity as a method to save money. The staff work really hard and the gratuity that is charged is not that much given everything that they do! Eric and I decided to take a break from Atlanta and spend some time a few hours away in North Carolina. It was mostly just a relaxing getaway. We drove around seeing new places and did a little shopping. One of the best parts by far was the dinner we had in Raleigh. I’ve been to Raleigh but usually I was just passing through or doing something for work. The downtown area had several places to eat and since it was a Saturday night, it was lively with people out in the streets. We decided to try Sitti, a Lebanese restaurant that seemed to be right in the middle of town where all the action was taking place. Even though it was late at night, the restaurant was packed with people. We started off with warm, flat breads and a zatar type dipping sauce. I ended up ordering a grilled fish dish, local to the NC area. The fish was on top of basmati rice and fresh kale. It was delicious! I will definitely need to recreate this at home! 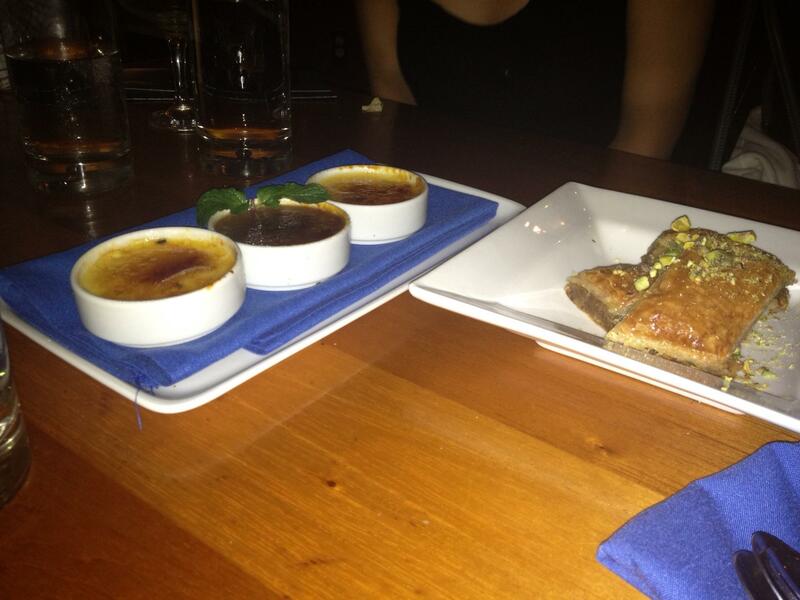 Afterwards, we finished the meal with baklava and a creme brulee trio. The trio included one with lavender and olive oil, one with chocolate, and then a plain. They were great. The chocolate kind of reminded me of chocolate pudding; it worked for me since I like chocolate pudding! We woke up early Sunday, had brunch, and eventually made our way back to Atlanta. It was a nice little weekend trip and reasonably close for a drive. Now I know that Raleigh has a few good places to eat and will gladly go back to try other things…like this moving trolley bar we saw going down the streets in town… that looks fun! Shout also has a rooftop bar so we decided to take our drinks upstairs to enjoy the music/views. A few drinks later, it was dancing time. It has been a really long time since I went out dancing but we took advantage of ladies night and walked over to cosmo/lava. The place was packed with a lot of the local undergrads which made me feel a little old but it was great to dance and be silly with friends. All in all it was a really fun night. I’m not sure I can physically handle staying up until 3 am often LOL, but I hope there are many more entertaining ladies nights in the near future! A friend invited me to a yoga event held at the W hotel in Midtown. Not only is yoga beneficial in any exercise routine to prevent injuries, but I also find it fun and relaxing. 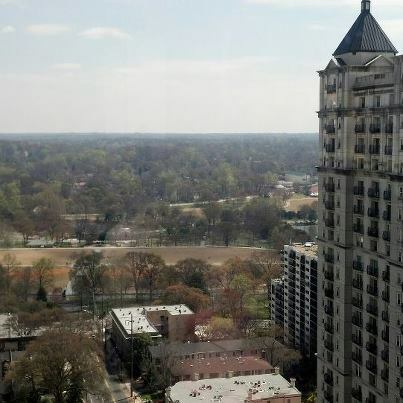 The views on top of the hotel are amazing and you can see all of Atlanta while holding your yoga poses. It has been a while since I attended a yoga class and it made me miss being part of a yoga studio! Usually I just do yoga at home but it’s much more entertaining with an instructor switching up the poses and sequences. . Afterwards, we decided to take advantage of the nice weather. We parked at my house on the other side of the piedmont park and walked over to a local restaurant for a bite to eat sitting in their outdoor patio area. As I sat outside chatting with friends, it really made me realize how much I really do love the springtime down here, before it gets too humid and hot to be outside. This was just what I needed to make my afternoon complete: good weather, friends, and yoga! What do you do when it’s cloudy and cold out? Go on a wine tasting tour to warm up! That pretty much sums up our weekend. 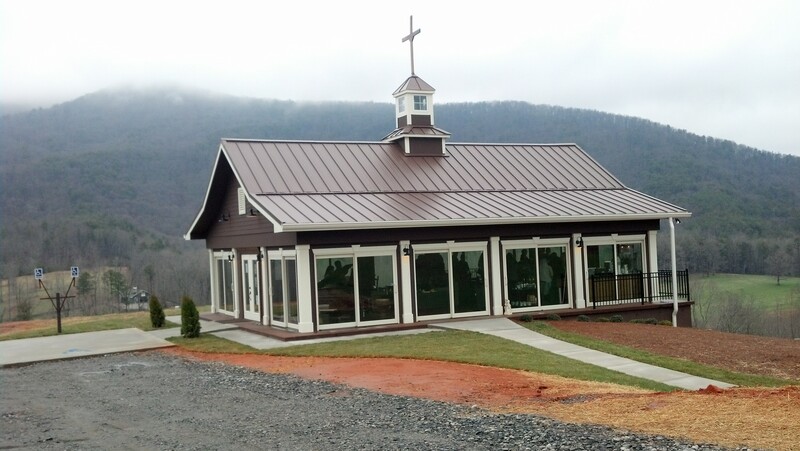 There are several vineyards and wineries located in north Georgia (it’s like our small napa valley lol). By this time of year, it is usually warm and sunny but lately it has been cooler out with mostly overcast/rainy days. We decided not to let the dreary weather ruin a good weekend and met up with friends for Georgia’s wine highway. Basically you purchase tickets and can try wines at the participating wineries. We made it to 4 wineries in the afternoon. Not bad considering our limited time frame. 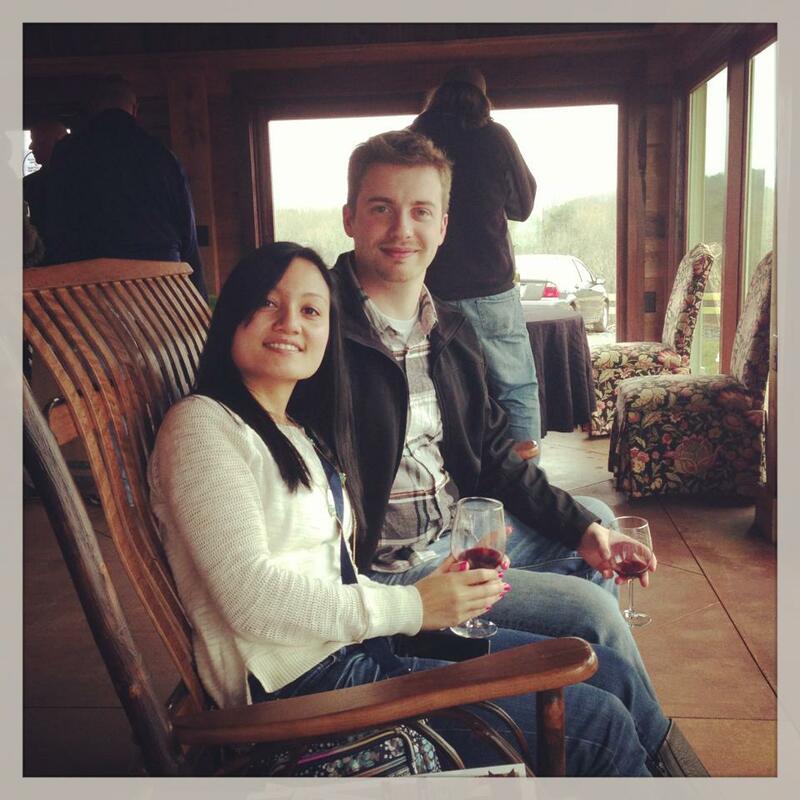 My favorite was the cottage vineyard and winery. They just opened a few weeks. I loved their little building overlooking the mountains, very cozy! Their wine was tasty too! I mentioned before that Sura suffered a paw injury. While playing outside, she sliced her paw on a sharp metal object and ended up needing sutures. 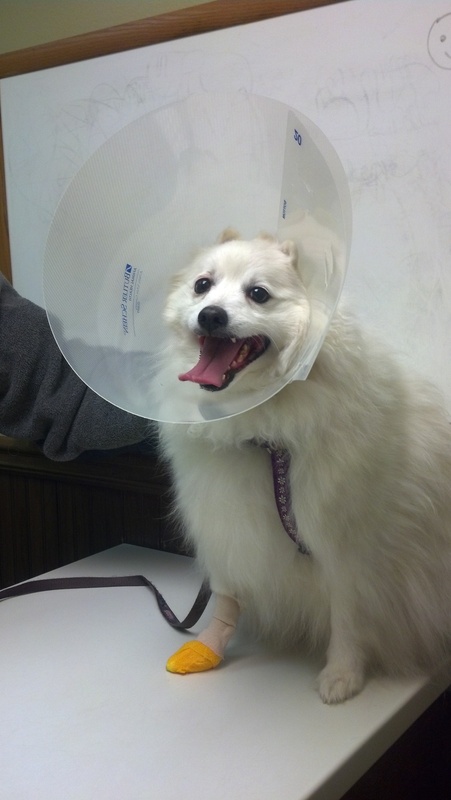 In order for it to heal, she had to wear an e-collar to prevent her from licking the wound. Unfortunately, she had to wear the collar for the past 2-3 weeks and we’ve had to take her to the vet for check ups every other day. Needless to say she hasn’t been a happy puppy lately and it’s made life hectic for us since we had to figure out a way to get her to the vet in between normal work schedules. With limited time, it’s a challenge to come up with fast, simple dinner recipes. One night, I decided to try a mushroom and asparagus pasta. It was light and easy, perfect for hectic weeknights! 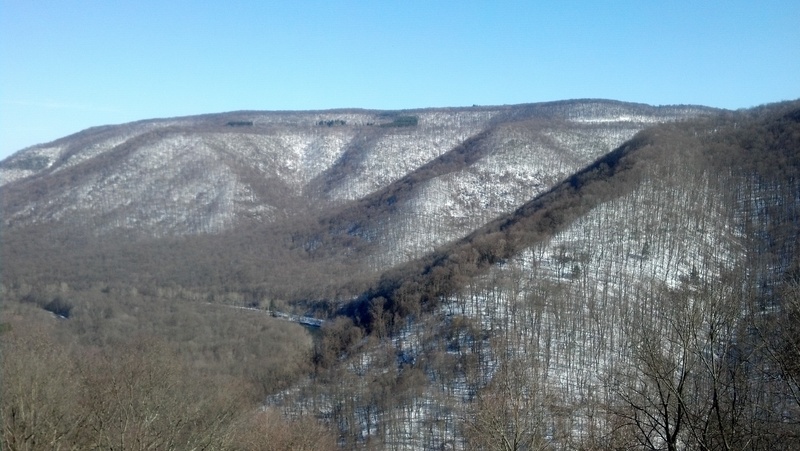 During our trip to PA, we decided to take a break from Pittsburgh and drive out to go hiking in Ohiopyle, PA. 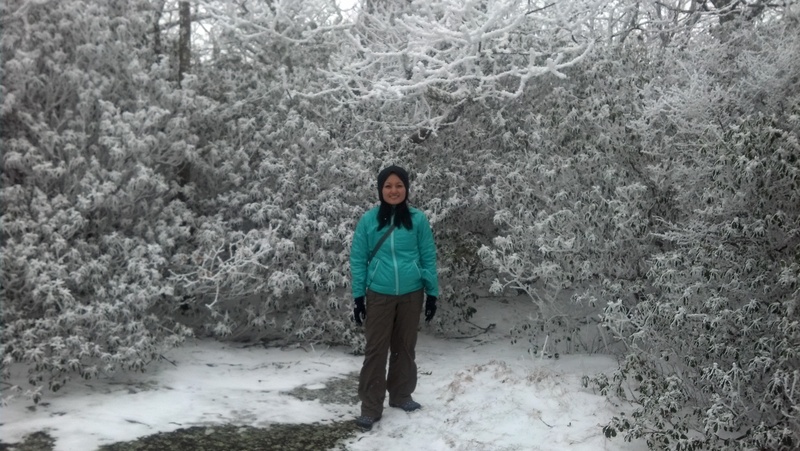 This was the second weekend in a row for snowy hikes. It’s like an all-time high considering I live in Georgia! 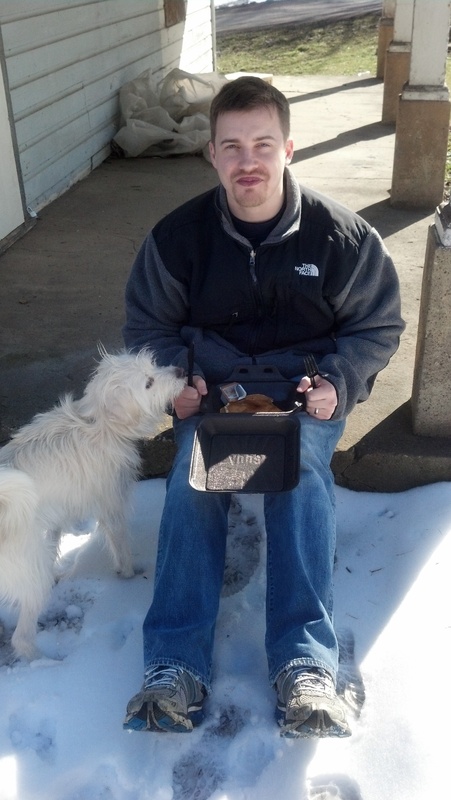 Anyways, we started off having breakfast; Eric decided to eat his outside to enjoy the sun and snow. 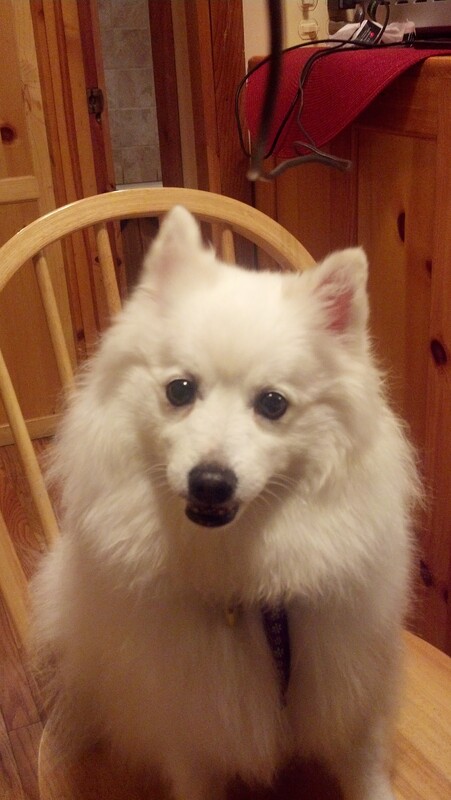 (I think Louie the dog was trying to sneak a little bite). Usually by this time of year, the weather is warming up and it already feels like spring. That was definitely not the case this weekend. We had friends come visit from Pennsylvania hoping to escape the cold but it just wasn’t happening this weekend. 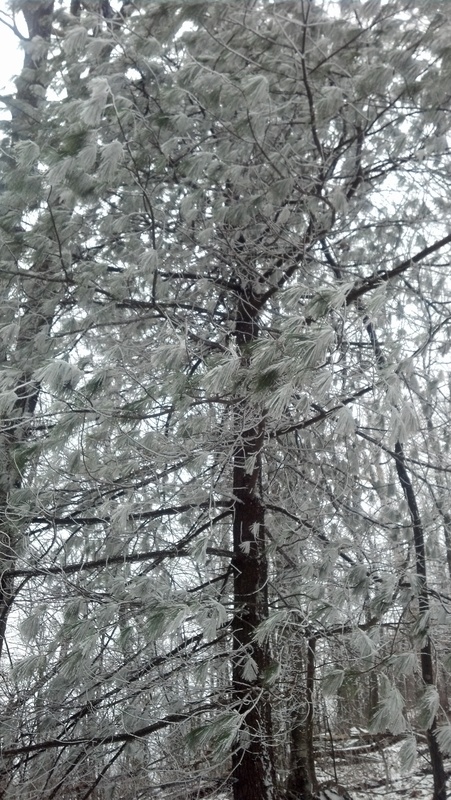 But, instead of complaining about the cold weather, we decided to go out and enjoy it. I mean, we used to live up north where the weather was cold this time of year so it wasn’t anything new for us. As we drove up to north Georgia, we started to see snow topped mountains and realized that our hike would end up being a snow adventure! 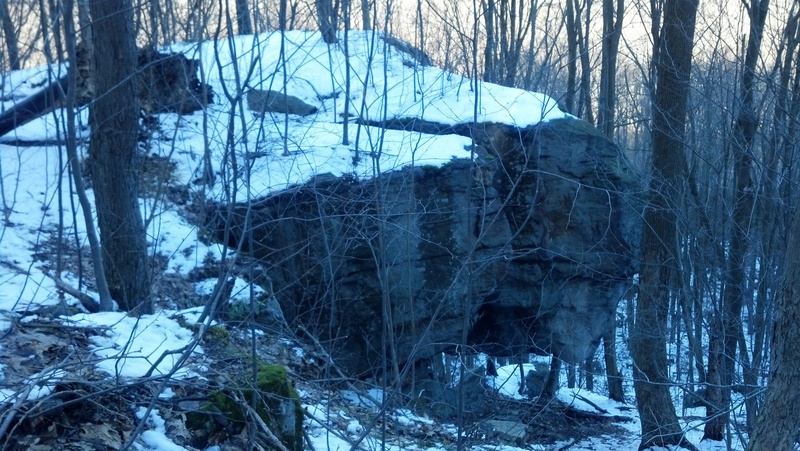 I was reluctant at first to make us hike in the cold and snow but our friends soon reminded me that they live in much colder weather and this would be just like their other hikes. 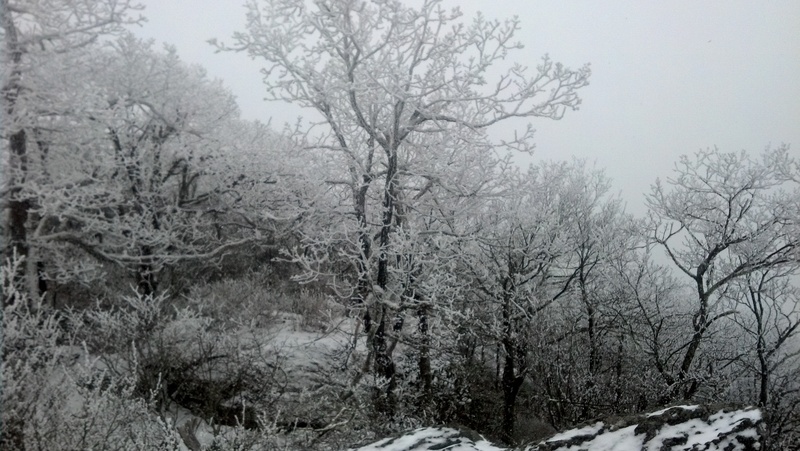 We decided to hike blood mountain, one of the hikes we did last summer, and it was amazing to see how different the views were with all of the snow. We recently had guests in town which gave us an opportunity to explore fun placess around Atlanta. One place I have always wanted to visit is the Buford Highway Farmers Market. Buford Highway is home to many restaurants specializing in cuisines from all over the world. There is even a Filipino restaurant! That being said, the farmers market is a good representation of the area. We decided to make a trip out there and see how it compared to other farmers markets. Not only was the produce section the size of a lot of markets, but there were different areas for specific foods.There was a whole section for sushi-grade fish (I will definitely be coming back to buy something for our sushi nights). The seafood area was busy with customers ordering all types of fish and workers rushing to clean and prep the purchases. Then, there was the Korean section. I was intrigued by the staff behind the stands slowly working to assemble something. I soon realized they were preparing Korean dumplings. 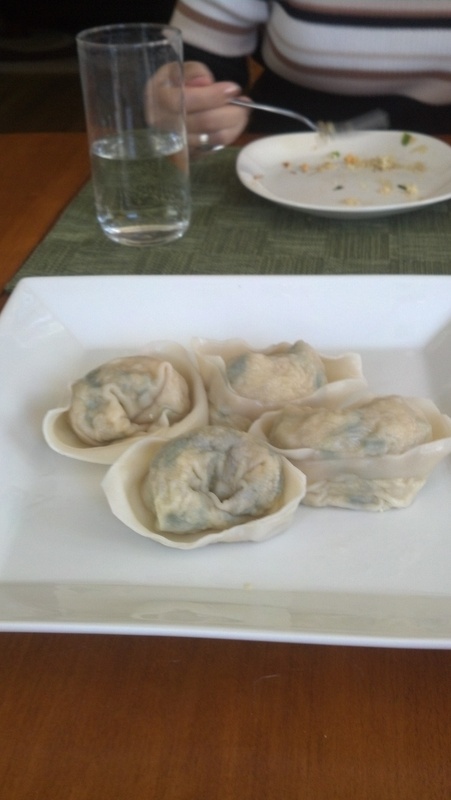 One person was making the mix, another was wrapping the dumpling, and another was packaging. You can either have them cook it for you and it is ready to eat or you can order as many as you want and take them home to cook. We decided to buy some of the mushroom veggie dumplings and some shrimp dumplings cooked them at home. Basically, you boil water, drop them in for 5 minutes or until they float to the top. 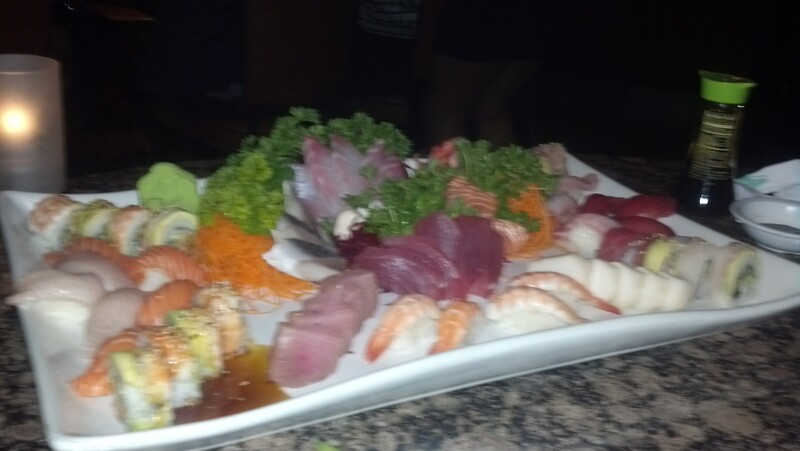 We had a little ponzu sauce on the side for dipping. I recommend cooking them at home so that is tastes fresh. These are pretty large dumplings and I felt full after eating 2. I’m really glad I finally got to see the Buford Hwy Farmers Market and I’m sure I will return soon for other neat and delicious treats!